This forty-six hundred square foot luxury (and green!) Sedona Bed and Breakfast and Spa rests on a hill with 360 degree views of red rocks by day and trillions of stars by telescope or the naked eye at night. A serene, pastoral, uplifting, panoramic red rock setting; like nothing you have ever seen before. Snuggle up with a book by your private fireplace or on one of our many decks. Relax and regroup in the 2-person whirlpool tub or generous double shower room and experience a warm towel waiting for you from your towel warmer. This is a kind of ambiance that is inspirational and fosters clarity and vitality. It is a place where you can sneak off; slip away and leave behind the stresses of life – a private, peaceful sanctuary on a breathtaking acre, doted with many mature trees and native vegetation. We are “Green” and Solar! 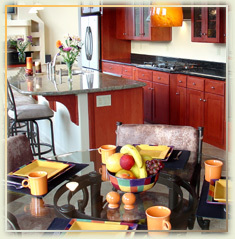 Enjoy your Sedona Vacation in a luxurious, healthy environment! Sedona Cathedral Hideaway is a Premier Sedona Bed & Breakfast that gets rave reviews on TripAdvisor and has the Highest Guest Satisfaction Rating of most B&B’s in Sedona (100%). We are a serene, personalized retreat that far surpasses the hotel or lodge experience. We will guide you to the best tours, galleries and sites from Jerome to the Painted Desert. When the touring is complete, return to our luxurious, peaceful atmosphere for personal renewal and creativity. Just a short walk to scenic Oak Creek, Red Rock Crossing, Crescent Moon Park, Cathedral Rock and Pyramid Peak. We have 2 large suites and each has scenic panoramic views of the famous Cathedral Rock and the tree lined Oak Creek Valley. You will stay in a tasteful, refreshing setting for anyone looking to get away to a secluded intimate retreat. Professionally designed, each suite creates a peaceful, romantic atmosphere for newlyweds or for those who desire to be like newlyweds again. SPECIAL, MADE TO ORDER, HEALTHY FOODS ARE AN EVERY DAY OCCURRENCE, ENJOYED IN AN UPLIFTING AND BEAUTIFUL ENVIRONMENT. “Fresh organic veggies year around, from our own indoor and outdoor gardens, when possible.” — Imagine those beautiful juicy 16 oz. homegrown tomatoes. Fresh eggs from our chickens that are free range and organically fed with no GMO food. Diet friendly and Gluten free food if desired and whole leaf tea from Trailhead Tea in Sedona. Air purifiers help with pollen and dust. Stetzer filters to keep electricity balanced and help you sleep. NO SMART METERS – A known cause of sleep disruption because of the strong radio waves. On site spa services are also available if you desire some extra special professional pampering and anti-aging consultation and treatments. Schedule a week of anti-aging treatments and go home looking five years younger. If you give us some notice we can arrange to have massage therapists come in, so you and your partner can receive a spa massage, at the same time. On site personalized Spa Packages are also available. Visit: www.ASpaForYou.com to see a listing of luxurious single or couples treatments available in your room or under the stars. Just to mention a few choices, there is Deep Tissue, Hot Rock and Energy Balancing. This is one more way to create a memory you will never forget. Ask us to reserve an in room massage for you. There is no better experience than going from the massage table to your own two person jetted tub with a view of the stars. In room massages are slightly higher than at their facility. Kitchen at Sedona Cathedral Hideaway Enjoy your breakfast in our fine dining room, on one of our outdoor decks in the morning sunlight, or in the privacy of your romantic suite. We want to know about your favorite foods and snacks so you experience personalized service while you are staying with us. Everyone loves to wake up in the morning to the aroma of gourmet cooking – homemade bread, pastries, coffee, latte, herbal tea or hot chocolate. You will love flavor of Larry’s homemade ice cream or Kathy’s fruit smoothie after a long day of site seeing. Our Inn Keepers Kathy and Larry on the deck outside the Evergreen Room. Sedona.biz – March, 2010: Learn why the Sedona Cathedral Hideaway Bed and Breakfast gets consistent 5-Star guest reviews at TripAdvisor. Interview includes audio and video. Sedona Film Festival's Most "Green" B&B award, 2012 and 2014. Solar - organic garden - Natural cleaning products - composting - on two wooded acres. Hummingbird Festival always 1st week of August Call us for info. Sedona Cathdral Hideaway is mentioned in the Arizona Official State Visitors Guide 2014, pg. 20 as the B&B to go to for birding. Hummingbirds are our specialty! Read article.